This is a new tour for Walking Adventures and the itinerary is still in the planning stages – Marrakesh, the Atlas Mountains, and the oases of the Sahara Desert are some potential highlights! Traveler Rewards Program: New Travelers receive a $300 discount on the Morocco 2020 tour! Returning travelers receive our Alumni Traveler Discount of 5-10% off the main tour price. Terms, exclusions and conditions apply. Check out our Traveler Rewards page for more details. Now accepting Early Bird deposits on this 2020 tour! An Early Bird is a $50 deposit that holds your spot during the planning stages of a trip, when we don’t have a set itinerary or dates. Early Birds are always refundable! We may offer 2 departures if there is enough interest, with the second departure taking place in the fall of 2020! Final dates and pricing will be available by April of 2019! Video from the Scouting Trip! Walking Adventures Guide Dan Friesen took a scouting trip through Morocco in early 2018. We’ll be putting together the itinerary for this new tour soon! Situated in north Africa, Morocco sits at a unique junction of influences. Bordered on the north by the Mediterranean, with Spain and Portugal just a stone’s throw across the Strait of Gibraltar, its western flank is hemmed in by the Atlantic Ocean, while the dreamy dunes of the Sahara Desert push up from the south against the 14,000-foot peaks of the Atlas Mountains. Historically, Moroccans were mainly Berber tribes in the eons before the 7th century Arab Muslim movement entered the region. Arab and Berber cultures and bloodlines combined and their armies, often called Moors, invaded and controlled the Iberian Peninsula of Europe for nearly 800 years. We are putting together this NEW itinerary! More details will be available. Pricing is based on double occupancy. Single rooms will be available for a supplement. Breakfasts included with a selection of lunches and dinners. Not Included. Travelers will be met at the starting hotel. Included. We use motorcoaches with a seating capacity of 40+ seats. Dan Friesen has been guiding tours for over 25 years on all 7 continents. He has hiked the Great Wall of China, hobnobbed with penguins in Antarctica, felt the spray of Iguazu Falls in Brazil, yodeled from the heights of the Swiss Alps, and walked the ruins of majestic Machu Picchu. Dan will be accompanied by a Walking Adventures assistant and national guide on this tour. He looks forward to exploring the delights of Morocco with you! Now accepting Early Bird deposits on this 2020 tour! An Early Bird is a $50 deposit that holds your spot during the planning stages of a trip, when we don’t have a set itinerary or dates. Early Birds are always refundable! We may offer 2 departures in 2020 if there is enough interest, with the second departure taking place in the fall of 2020. We will take an average of 25-30 travelers on each departure. Our guide to traveler ratio is 1:10. 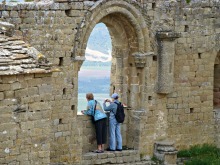 New Travelers receive a $300 discount on the Morocco tour! Returning travelers receive our Alumni Traveler Discount of 5-10% off the main tour price. Terms, exclusions and conditions apply. See the Traveler Rewards page for more details or contact us with any questions at 800.779.0353 or [email protected]. We generally walk at a pace of 2 to 3 miles per hour. In most cases, we are not “strolling.” We are walking at a relaxed but steady pace. Your experience will be significantly affected by your level of physical fitness. If not walking regularly at home, we strongly recommend that you make a priority of “training” beforehand in order to both enjoy the trip and avoid medical issues due to overexertion. If you have questions about your ability to participate, please talk with our office at 1.800.779.0353. We have adopted a walk difficulty rating system, which contains a numeric indicator for trail incline and an alpha indicator for trail terrain. The explanation for this system is presented below. We will be developing the itinerary for this Adventure. Once the itinerary is released, we will accept registration deposits ($500) to save space. If you have Early Birded with a $50 deposit, your spot on the tour will be held for 2 weeks after the itinerary is published while you make a decision on whether or not you’d like to register with an additional $450 deposit. If you decide not to join us for this tour, your Early Bird can be refunded or transferred to another tour. We look forward to sharing the delights of Morocco with you in 2020!